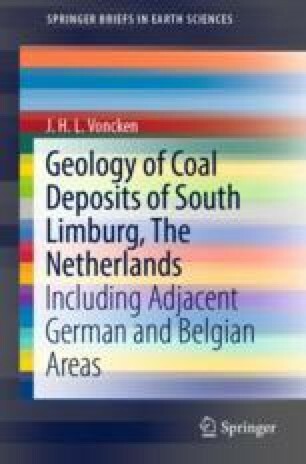 This chapter tells about the history of coal mining in the Dutch area of South Limburg, and in the adjacent German (Aachen) and Belgian (Campine) areas. Coal mining in this region of Europe started in the Middle Ages. Coal mining on an industrial level started in the German and Belgian areas in the middle of the 19th Century and beginning of the 20th Century respectively. In The Netherlands it began in the 1890s, and into the beginning of the 20th Century. Bergbaumuseum Gruba Anna-2 (2018d) Grube Gouley. http://www.bergbaumuseum-grube-anna2.de/index.php/grube-gouley/. Visited May 2018. (In German language). Bergbaumuseum Gruba Anna-2 (2018e) Grube Teut. http://www.bergbaumuseum-grube-anna2.de/index.php/grube-teut. Visited May 2018. (In German language). Dinoloket (2017) Chronostratigraphy chart. https://www.dinoloket.nl/carboniferous. Visited December 2017. Eiffelnatur (2018) Steenkolenmijn Gouley. http://www.eifelnatur.de/Niederl%E4ndisch/Seiten/Steenkolenmijn%20Gouley.html In Dutch Language. Visited May 2018. (In Dutch language).